The Beast Hood is available in Brown and comes in Adult’s One Size Fits Most. This hood can be used for Beast from Beauty and the Beast. If you’re feeling a bit more savage, create your own Beast by pairing this hood with our Werewolf Gloves and Brown Beast Legs. 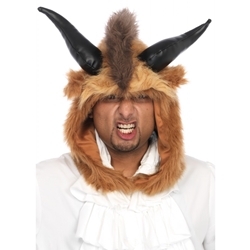 The Beast Hood can also be used to create a Centaur or Satyr Costume. Unleash your inner Beast this Halloween!